Incredible footage has emerged of an enormous moose chasing two snowboarders at break-neck speed down a mountain in Colorado. Snowboarder Cheri Luther took the remarkable video as she raced down the slope at Breckenridge Ski Resort some 130 kilometers (80 miles) northwest of Denver. Luther initially thought the animal was a horse but, when the beast drew close enough, she realized what it was and quickly pulled out her phone to snap evidence of the bizarre chase sequence. “I turned around to look for my friend and saw this ‘brown horse’ charging right for me, so I went to the right and then realized it was a moose! I was too scared to stop in case he was chasing me!” Luther said in a Facebook post. 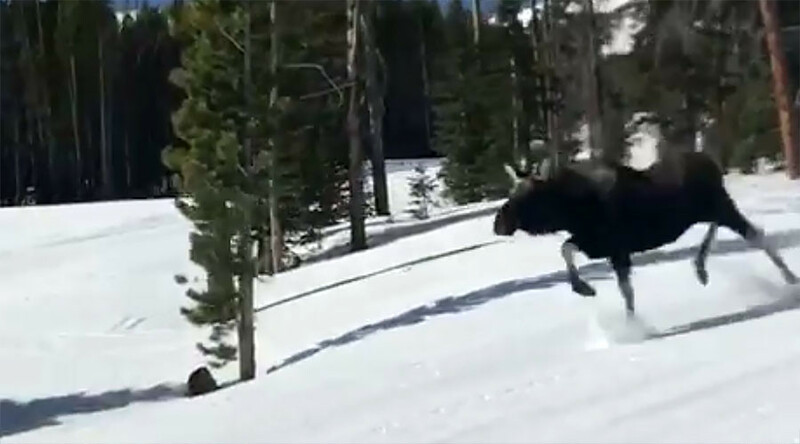 The video shows the enormous moose come within mere feet of the snowboarder, even looking set at times to run her down as it effortlessly accelerates, charging through the snow. Luther had a lucky escape, as Colorado Parks and Wildlife told NBC 9 News that the moose, which they believe was female, was agitated. The snowboarder’s friend Amy Loofa caught the rampaging beast from another angle, set slightly higher up the mountain. Breckenridge Ski Report said no one was injured in the incident. “We share the mountain with a number of animals that live in the area and this is a good reminder for guests and employees alike to keep away from wildlife and report any moose sightings right away,” John Buhler of Breckenridge Ski Resort told NBC. Colorado Parks and Wildlife say moose are naturally very curious animals. They advise people who encounter them while on the slopes to stop skiing and to try and keep a large object such as a tree in front of the animal. They also warned against taking out a phone to record the incident.